Corporations are the best environment for innovations. This isn’t an oxymoron, it’s reality. Large multinational firms are in fact like “mum’s hotels” of innovations, where the advantages outweigh the disadvantages. Still don’t believe us? 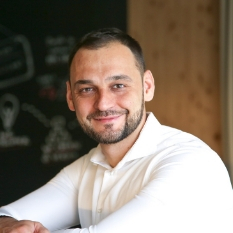 Michal Kalousek, one of the founders of Direct People, explains how to stay on your mum’s good side and co-operate with her in bringing to life projects which would otherwise have remained in the closet. In the community of innovators we often hear complaints about how difficult it is to innovate within corporations. How corporations are big, slow, indecisive, ineffective… However, if like me you have experience in a startup environment as well as projects for large firms, your perspective will shift. From my point of view corporations represent the most accommodating environment for innovations. And I am absolutely serious about this. In fact, corporations are like a “mamahotel”*. You just have to know how to stay on your mum’s good side. The most fundamental thing of all is that within a corporation it is relatively easy to create a functional innovation and with a low degree of risk. Introducing innovations within corporations is facilitated especially by so-called unfair advantages. These stem from the size, market position and substantial financial and non-financial resources of the corporations. If such an advantage exists, it is important to be aware of its full implications – to make full use of its potential and above all to maintain it throughout the project. From the very beginning, the corporation’s infrastructure and resources give us an immense head start compared to anyone who is building a product or service from scratch. Unlike a startup, in corporation it is easier to obtain finances for the project initial phase. It is essentially enough to approach the right person with a good idea. Even though there are still commissions that want to hear about the project, it is nevertheless easier to obtain money in a corporation than to repeatedly try convincing an investor. Another indisputable advantage that‘ is worth being aware of is that you are not spending your own money. In general it applies that the larger the firm, the more excess resources or “leftovers” it has. These leftovers have already enabled the launch of many projects that would otherwise remain in the closet, or would not have been even thought of. In creating innovations, people often forget that familiarity and trustworthiness of the brand plays an important role in whether or not an innovation will succeed. In this respect, corporations have a head start as well. This is especially true for brands that are well established for the target group. And then we have non-financial resources. Corporations are full of specialists in all kinds of fields, who are well worth making use of. Do you get it? When you are a startup, you have to find and pay someone for every single specialisation. As a result, resources in startup projects are often reduced to a minimum, which is often at the expense of the quality of outcomes. In a corporation you still have to pay for your resources, but you get them cheaper, quicker – plus bargaining for resources is considered in the budget from the very beginning. Thanks to already having experts, as well as established infrastructure of the corporation, the smaller team focusing on innovations does not have to bother itself with a range of operational matters such as administration, technical background, recruitment and of course the aforementioned key factor of brand (un)familiarity among the target group. Let’s not only be optimistic. Innovation within corporations also has its downside, just like living with your mum when you’re 30+. Among the usual traps we must be careful not to fall into are autonomy, demands for large and fast profits, and financing via the annual cost system. The innovation team may have a certain decision-making power, but sooner or later it comes up against the jurisdictions and responsibilities of other teams. Clashes often take place with legal or marketing departments, which have a clear and uncompromising view of things. And so sometimes what started out as a clear advantage in form of possibilities of utilising internal systems and departments eventually becomes a disadvantage and complication. It is good to bear this in mind. Innovating under the wing of a corporation also brings a certain degree of impatience. The management expects large profits within a short time-frame. At a certain moment, (im)patient waiting for the investment result can be replaced by a demand for continuous dividend. If a product becomes unsatisfactory in this respect, then the funding begins to drain away. Furthermore, corporate financing dictates that the resources we do not spend in time must be returned at the end of the year. And we can forget straight away about crediting them to next year’s account. That is why it is a good idea to create a certain interim state – “drainage budget” – or to pay for some things in advance. In general it is good to realize that obtaining an excessively large budget may in the end be counterproductive. In conclusion, just briefly: another danger is the fear that the innovation team action could threaten a functioning brand. You might also be thwarted by internal rivalry, which comes with the innovation programme announcement across the entire company. Perhaps the last advice: keep in mind that it is better stay away from certain internal processes. Yes, promoting innovation within domestic corporations is still very complicated, but it is not impossible. A large number of them are in the hands of foreign owners, for whom the Czech market is not promising enough to launch an original project. However, innovators have to take a fair share of blame for that. They sometimes lack ambition to consider global services and ability to convince key people. On the other hand, innovations have their place in corporations. it is just necessary to create an environment in which they can succeed. Otherwise, attempts to innovate will be killed off by the corporation’s immune system. When innovating and using someone else’s money, it’s necessary to understand your superiors in decision-making positions, and to show them that your innovations can outmatch other opportunities and become a new, long-term source of revenue.